The perennial Fine Arts Day will be held on the IU South Bend campus February 24. The event provides a sample of the college experience in the arts to prospective high school students from surrounding schools. The visiting students will be introduced to Department of Fine Arts faculty and get a taste of what sort of work they might be doing as students in the fine arts program at IU South Bend. That Saturday, students will follow an itinerary starting at starting at 9 am and lasting until 2 pm. The students meet faculty members in the campus Art Gallery in the Education and Arts Building to begin, have a meet and greet session amongst the pieced of the Student/Alumni Exhibition, and then spend a few hours learning a little bit in different mediums. Sculpture, 3D, drawing, graphic design, and printmaking are all on the list for activities. 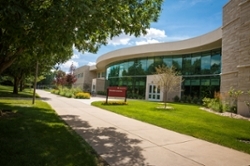 The students will then have a free lunch with admissions counselors to have conversations about their academic career and what direction they’d like to go in their further education, and how IU South Bend can help get them there, before going on a campus tour highlighting the creative spaces that the Department of Fine Arts uses.